The chapel (50 ft long & 28 ft wide) was built in 1843 at a cost of £640 and opened for worship on 15th March 1844. In 1851 it had seating for 300 worshippers. On Census Sunday 30 March 1851 it had 51 worshippers at its morning service and 99 at its evening one. In addition it had 59 children at its Sunday School. The chapel closed c.1890 but reopened the following year. It was never a strong cause and finally closed c.1921. The chapel was used as a magistrates court in the 1940s & when seen in 2003 was in a derelict and dangerous condition. It had its own burial ground in front of the chapel, which had two gravestones visible on the right-hand side. The building bore a resemblance to Bridgnorth Baptist chapel erected in the previous year. The chapel has now (2018) been demolished. There was also a very small Particular Baptist congregation, meeting in a chapel in Aston Street. This congregation had been in existence since the beginning of the 18th century. 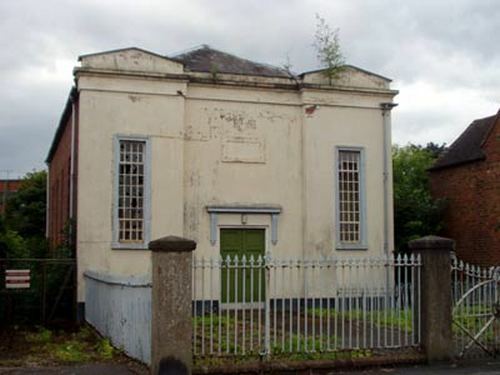 Their chapel was built c.1780 & it was licensed in January 1782 at the county quarter sessions. In 1841 there was a fundamental split in the congregation which resulted in the formation of a 2nd Baptist church meeting in the Zion chapel (above). In 1851 there were 18 worshippers in the Aston Street chapel at their morning service and 13 at their afternoon one. The chapel closed in 1877.